I’m so excited about today’s contributor post from Jo from Zuer Designs because this project was a very fun collaboration between Jo and myself. 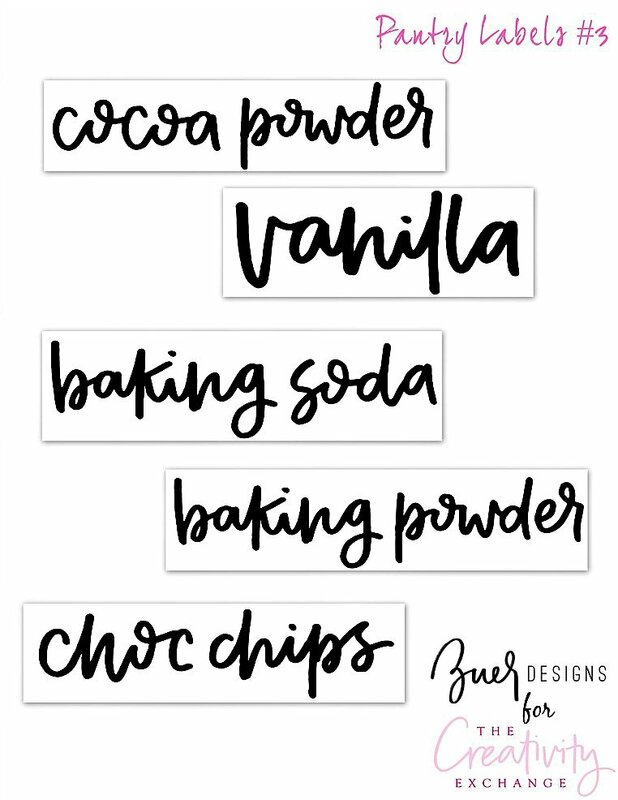 I cannot tell you just how amazed I am with Jo’s hand lettering, which you can see in these fun free printable pantry labels. If you get the chance, be sure and check out her work/custom designs on her website and Instagram here. 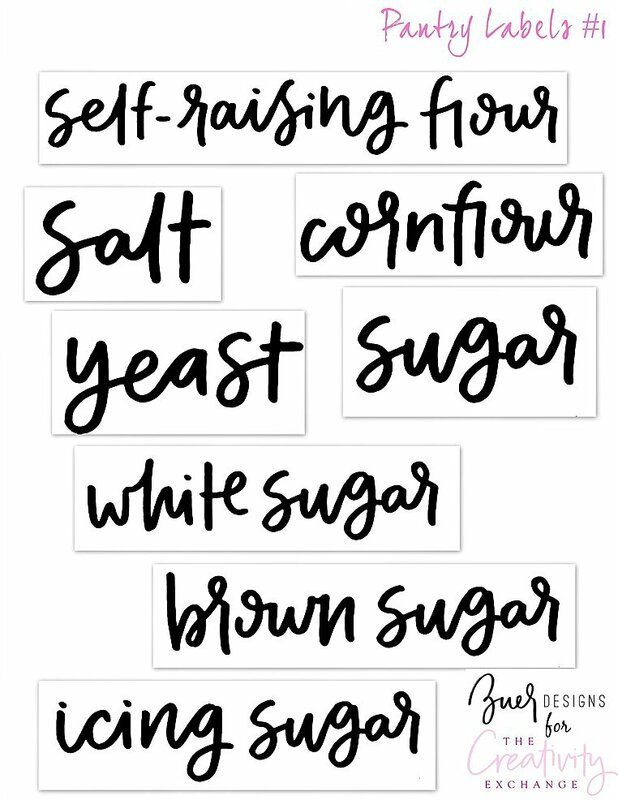 Today, Jo is sharing her beautiful free printable pantry labels, which I used in my baking cabinet/pantry in the images. So on to Jo’s March contributor post! Hi everyone! So glad to be back again for my March contribution. 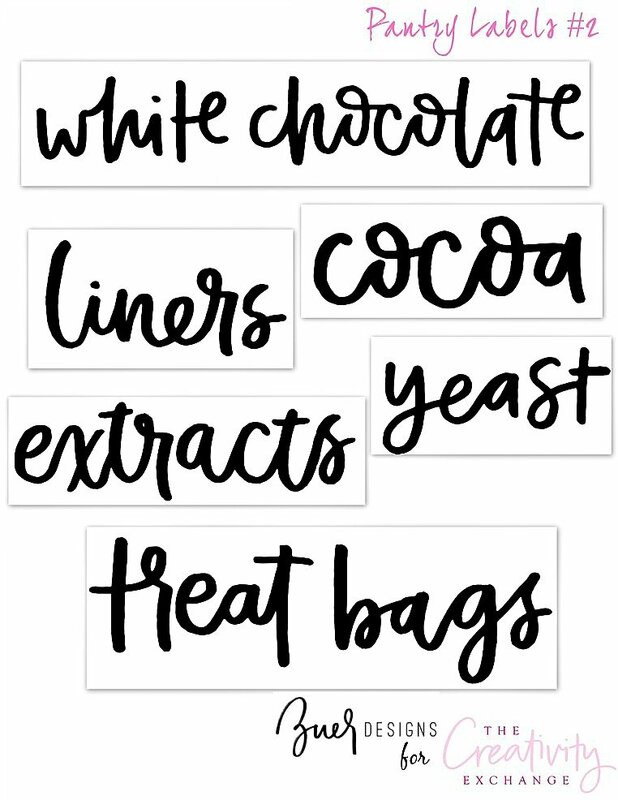 This month is super exciting, not only because it’s my birthday month, but because I have these awesome free printable pantry labels that I hand lettered for you! These labels are hand lettered in a modern loopy font. There is a label for almost everything you could ever have in your pantry that needs labeling! From flour, to spices, to coffee and baking sprinkles, I’m sure you’ll find it! We have found that it’s the best to print these labels onto Silhouette clear sticker sheets (amazon affiliate link). You can buy a two-pack of the Silhouette labels (8 sheets in each pack) on Amazon here. You don’t have to have a silhouette machine to use these sheets and will work on standard printers. It’s important to note that when printing on these clear sheets, you’ll need to carefully follow the instructions below to get the best possible quality labels. 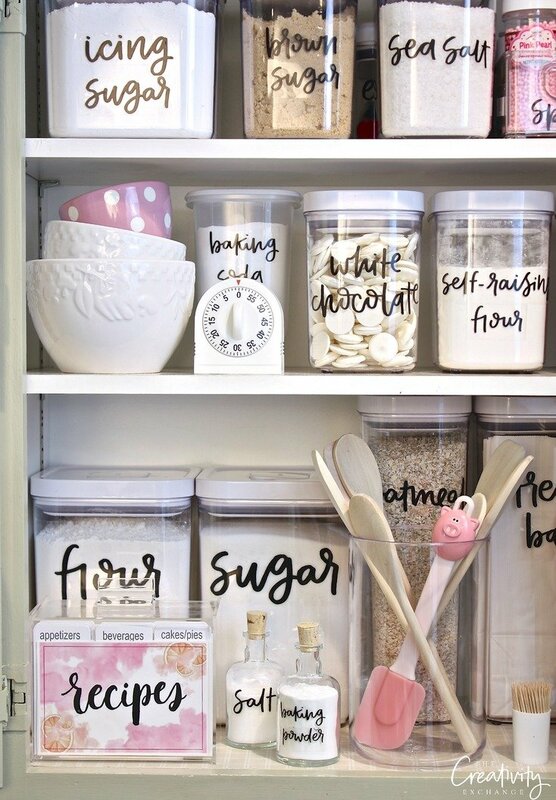 As you can see, Cyndy used the labels in her baking cabinet pantry and they help make everything identifiable and fun. There are eight sheets of labels, which are identified below. If you want to edit your OWN text, you can do that that here. **Updated 4/29/16** Please read the instructions for printing below as the instructions have changed to get even better quality on the labels. These free printables are for personal use only and may not be resold, or for commercial use. Click on the link and download the image of the sheet of labels below that you want and save it to your “pictures” file on your hard drive. If you have a Mac, you’ll hit control and right click to save to your pictures. Go into your pictures file/photo editing software and open up the image file just like you would normally go to print a photo from your computer. Load your silhouette clear sheets into the printer but be sure and do a test run first on paper (make sure you have more than 50% ink). 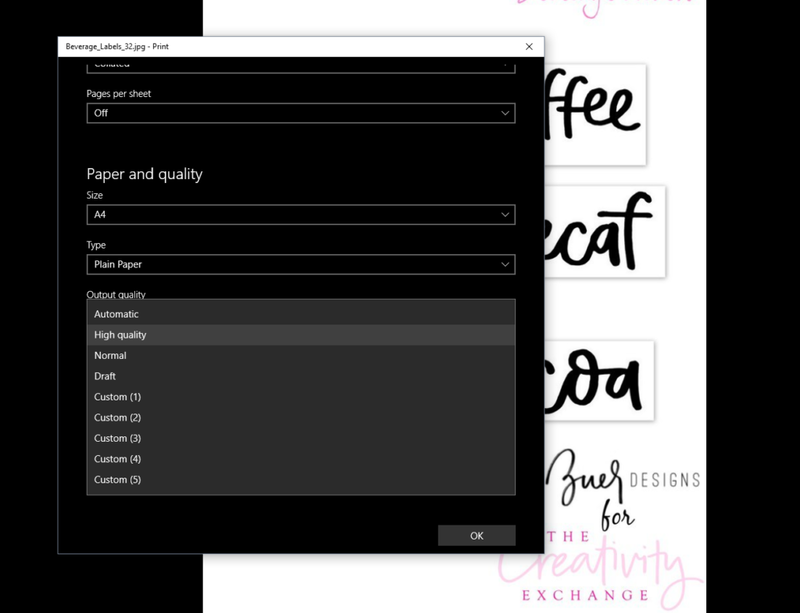 After you hit the print or print preview button, go into your advanced printer settings/image quality or printer set up and choose the “Best” or “High Quality” print quality. This is very important and will make big difference on the level of ink used on the sticker sheets. All printers “conserve” ink and by default, printers are set to use the minimum amount of ink. Because we are printing bold black ink on slick paper, if the best quality setting is not used, the font will come out faint on this particular type silhouette sticker paper. If you have absolutely no clue, just do a test run on paper and see at which point in the printing process you are given the option for advanced settings or settings for image/media quality. 6. Print only one silhouette sheet at a time (to prevent smearing) and let ink dry at least 15 minutes. Here are the different label sheets available. Follow “step 1” to save the sheets of the labels you would like to your computer. 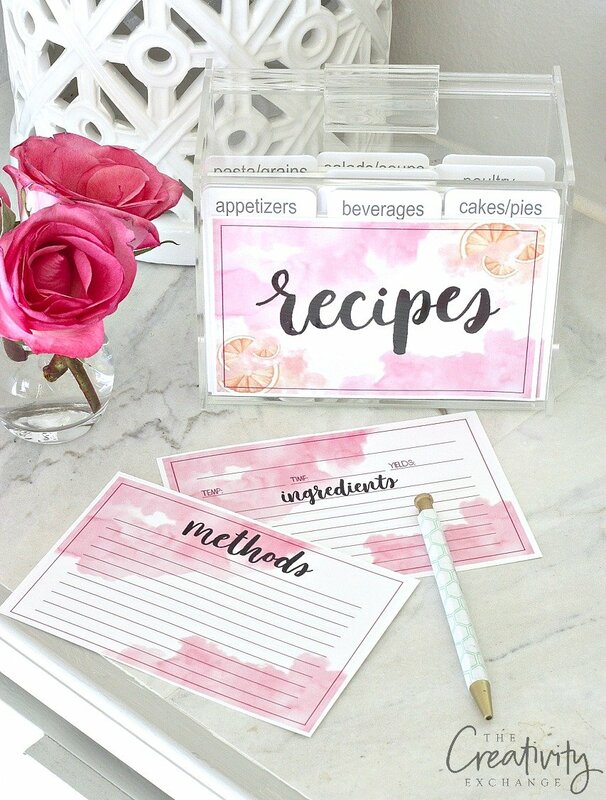 If you’re also interested in the recipe card free printables as shown below, you can find that printable in my post here from my January contributor post. If you want to edit your OWN text, you can do that that here. By the way, be sure and check out all the other great containers and items that Cyndy has pulled together to use these labels and get organized in The Creativity Exchange shop. Thanks for stopping by and you can visit me here! Where did you get your canisters from? All I can seem to find are round ones. Hi, Morgan! I use the same canisters in my pantry, and they are the OXO POP containers. I LOVE them! Costco has the 12-container set right now ON SALE for $59.99. It’s the best price/value I’ve ever seen! Hope that’s helpful! Nice labels. Did you create those fonts? If not, what are those fonts? 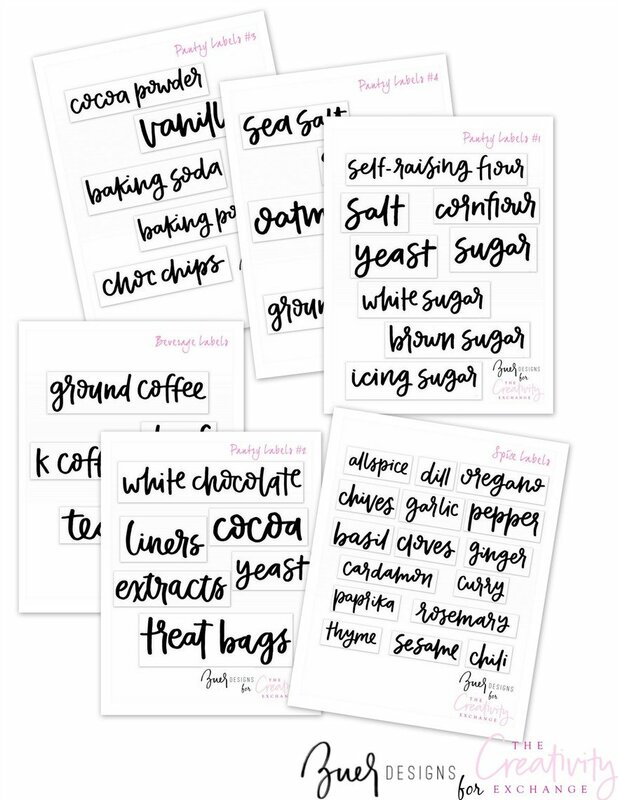 Jo, I love the font on these printable labels! Thank you! Cyndy, I am inspired to organize my pantry and make it pretty like yours. Has their been an updated list? 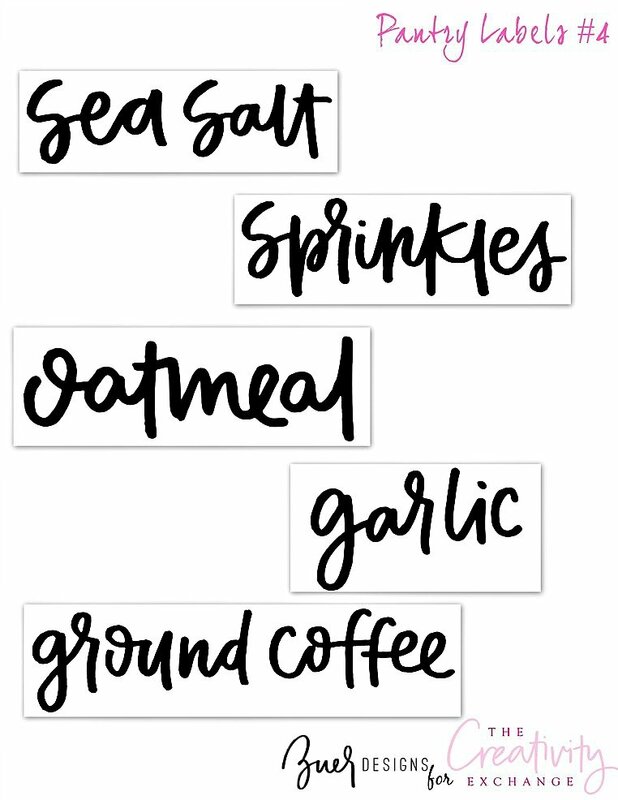 I would love to use labels for things like almond flour, coconut sugar, etc. Anyway we could get them customized? I can’t find the post with the editable printables..HELP! <3 these!! Hi there! I love these labels! Can you share the link of the blog post for customizable ones? Hello is the font available for costumizable items? Where and how do i get it? What’s the name of this font? Thank you so much! 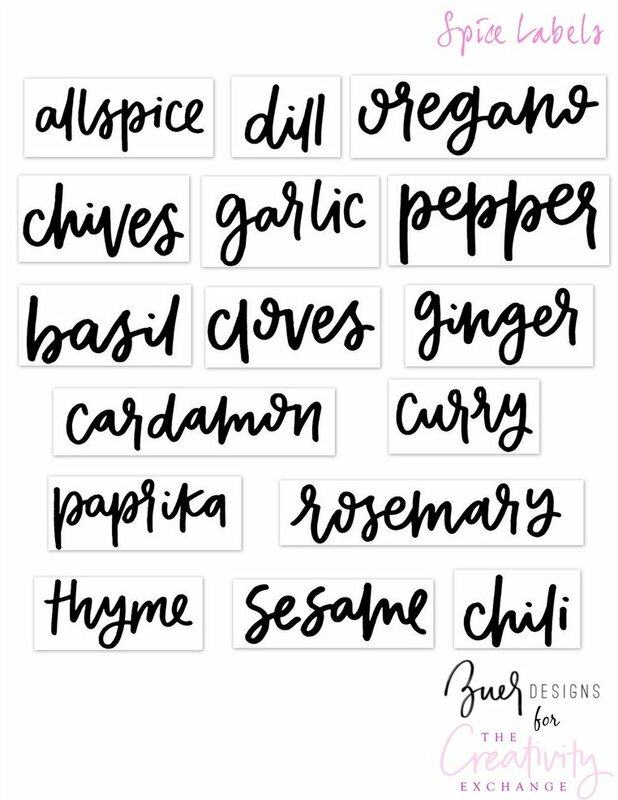 hi Cindy, can you send me the link to do editable printables that you can customize in that same font and type in your own pantry items or any other labeling around the home! Is there a customizable list for these? I would love to use these for my pantry and for my office. They are the perfect font! Thanks! I’m so inspired to go home and totally redo my pantry. Thank you so very much for these printables. I had a problem with a couple of the downloads #5 and the last one. Where are the small cork bottles from? How about making one for bread crumbs, dried fruit, nuts, beans? That is all I can think of. These are so fun! Thank you both so much for these adorable labels. 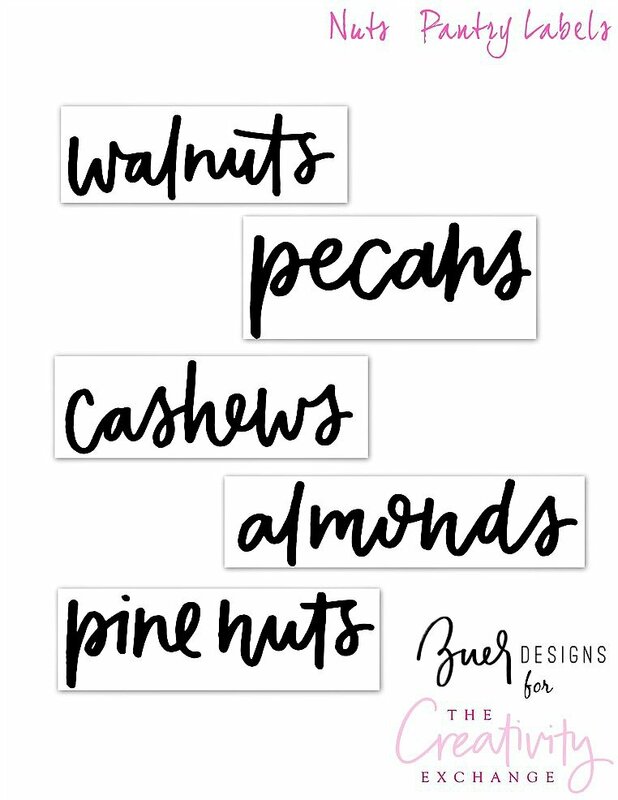 I am in the midst of planning a complete overhaul of my pantry, and plan on using some of your storage ideas, Cyndy, and these cute labels from Jo. Can’t wait to get it started! BTW, did you know it is “self-rising” flour, not “raising”? I caught that, too, with the “self-rising.” Any chance Jo could write one with the corrected word? 🙂 We’re grateful! It is called “Self-Raising Flour” in both the UK and Australia. Love this font! Do you mind sharing the name so I can download it? I can’t wait to print these – the lettering is so happy! How can you not smile when you open the pantry and are greeted by these! Thank you! Do I need a silhouette machine to print these? Thank you! Joann had the sticker paper so I am printing away! Love some good calligraphy. oh crumb! I am having a tough time trying to print these labels on my HP laser printer! I am using the Silhouette clear sheets. Can I go to Kinkos do you think? You can also use an Avery 5662 Labels. Do you know what spice jars? This is exactly the type of font I have been looking for. Here are some extra ideas for more labels, that I would love! Cranberries, Palm sugar, macadamias, linseed, sunflower seeds, pine nuts, sesame seeds, gravox, bi-carb soda, mixed nuts, kelp, bread improver, popping corn, gelatine, almonds, dried Apple, dried apricot, cornflour, currants, prunes, raisins, dates, brown sugar, coconut, raw sugar, bread crumbs, custard powder, rive flour, black chia, almond meal, salted almonds, pecans, Brazil nuts, pumpkin seeds,pure icing sugar, icing mixture, bakers flour, school snacks, plain flour. but I imagine it would defeat the purpose of having such gorgeous labels if only half the cupboard has them. These are so pretty! Just wondering though.. When I go to wash out a container will the label come off? And would it be best to wash by hand or in the dishwasher? Thanks so much! This is my question also. How well does the sticker paper stay adhered? Love this so much, thank you! Any chance you will update on best papers? Would love to do in vinyl on my printer. Thanks so much for providing these, I’ve printed all these and made over my pantry and totally LOVE it! It looks so much cleaner and more organized than multiple packaging colors and sizes! If you guys are still working on a request list id love to add some to it! Cinnamon, cumin, turmeric, cereal, lentils, and snacks. Those are my only blank containers currently, pretty good! Can normal Kmart printers print on this paper? Thank you so much for this page. LOVE the font. Such a cute idea and the update on how to print with iMac was definitely helpful. Didn’t quite look like that but I figured out how to fine/High quality print. THANKS! Hmmm… I haven’t heard anyone mention that Susan. Did you save the image to your hard drive like we mentioned in the instructions and printing at full size? Maybe try rebooting your printer? I would try rebooting. I would also just check the box for paper instead of brochure/glossy that you may be checking for the silhouette? Please keep me posted. Thx! Love it. 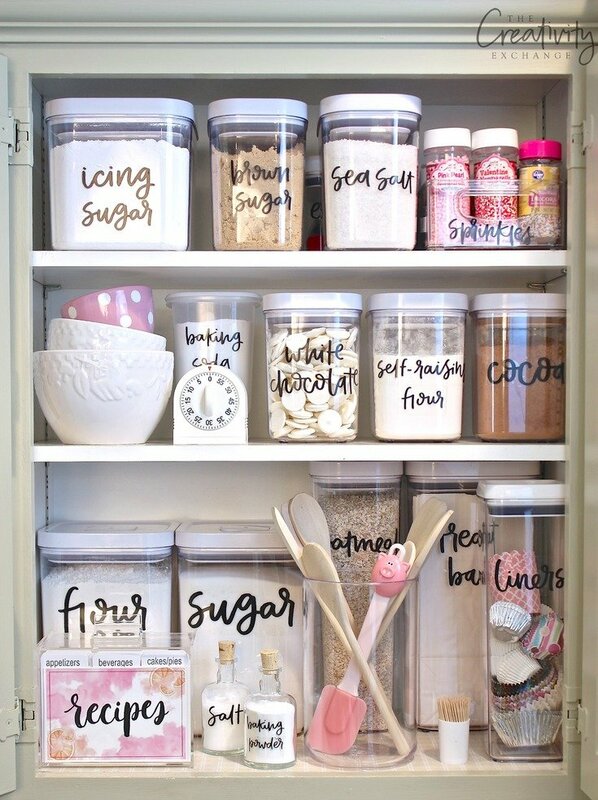 I am reorganizing my baking and pantry today and this is perfect for what I need. i would love to be added to a list of when you update these? Theyre amazing!! Thanks so much!! I love this!! It is so adorable. I was wondering where you found those storage containers? Thank you! I was also wondering the same thing?? How do i go about getting some more words? There is no Recipes also?? I love these but question? Am I crazy or isn’t the spice cardamoM? Not CardamoN? I’m loving these labels!! 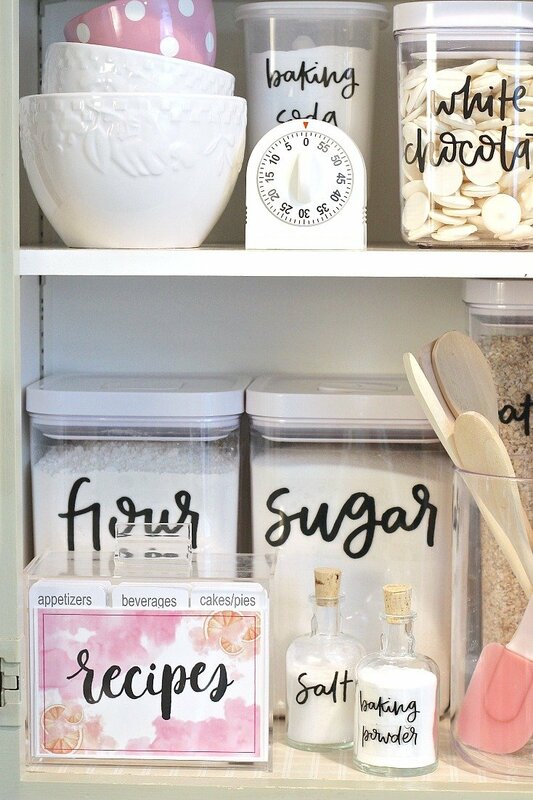 I am re-doing my kitchen with some open shelves and these are perfect on some glass canisters! I am absolutely in love with these labels as well! They are exactly what I’m looking for for my pantry! I have some suggestions of additional items to be made…coconut flour, coconut sugar, whey protein, almond meal or flour, tapioca flour. I have a lot of spices that are also not included that I would love! Also, are these labels waterproof? Is there a way to make them water proof so when I wash the containers, they won’t be ruined? Thanks! Can’t wait for more labels! What font is this? I would love additional labels that are not listed! Thank you for this printer-friendly organization pantry labels! I absolutely love these! I am so excited to do this, even wanting somewhere to display them after I do. 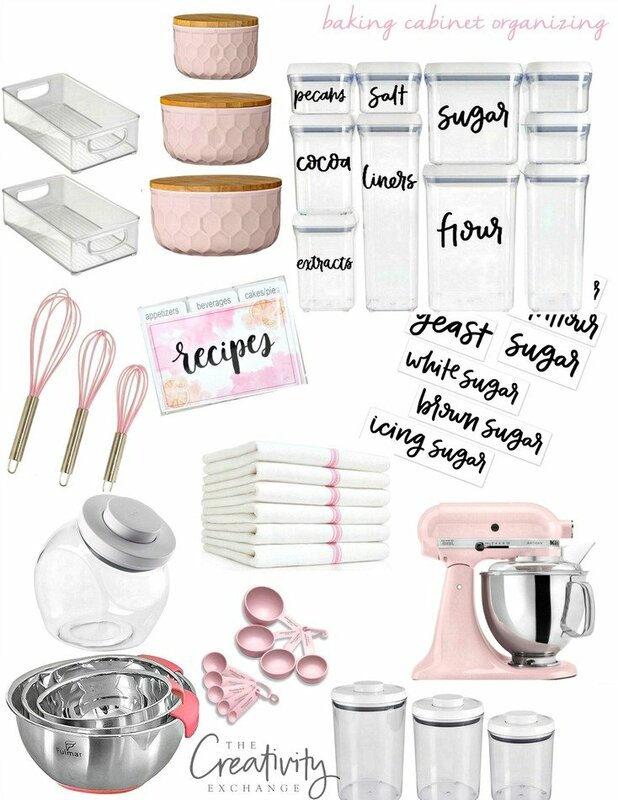 I would love to see a cake flour printable though! Agree 100%!!! I would totally pay for this font if you ever make one! Then we could all make the labels we specifically need. Please let us know if you do, Jo. I am in love with it! Thank you! What is the name of the font. You mentioned Hokey Pokey in an earlier post so I am not sure if there is another one that is supposed to be listed? Hi Gretchen, Jo here! The font is still called Hokey Pokey! Needs to be self rising flour, but those are so cute! Could you possibly do a HOT CHOCOLATE label? Love, love the printable labels in your Five Favorites. Cannot find a link to download them. Are they still available? 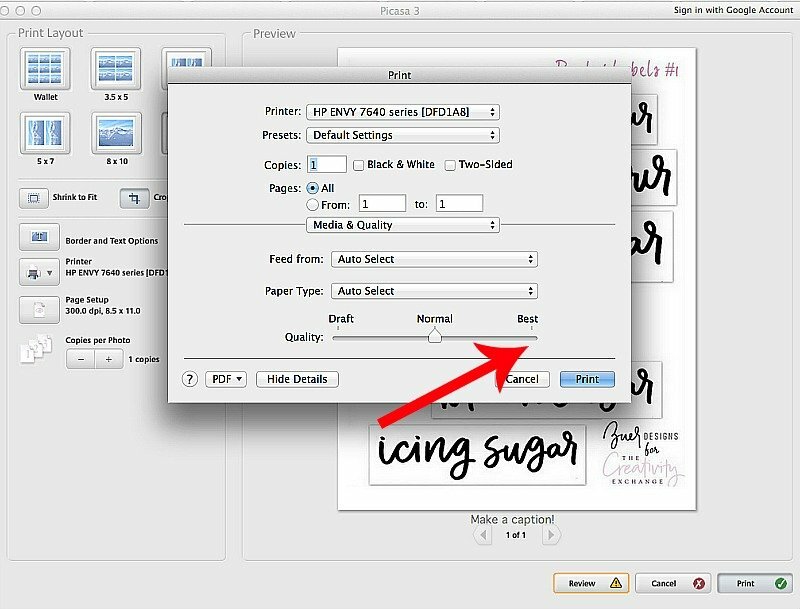 Love, love the free printable labels in your Five Favorites list. Are they still available? Would love to order them but cannot get to them through any of the links. Could you tell me where you got the canisters from? Thanks in advance! P.S. Thanks for the printable labels as well!? There is no such thing as cardamon. This is a rampant misspelling of the word CARDAMOM. There is really no excuse, it’s not like it isn’t printed correctly on the label of the original container. Hi there Bon! Normally I wouldn’t approve and allow such a rude comment on my blog but I am going to approve it for all to see. Here’s the thing; these labels are FREE! They were hand designed and drawn, which took endless hours to draw out, upload and convert to printable labels. Again, for FREE! For readers like you to print and use. Out of all the more than 45 labels that were created, there was bound to be a mistake or two that Jo and I didn’t catch. There is absolutely NO need to come on here and leave a rude comment and telling us there is “no excuse”. It’s really a “rampant” shame that there will always be some person that can’t help themselves from angrily find fault with other’s generosity and voicing it. There really is no excuse for not being kind and appreciative. 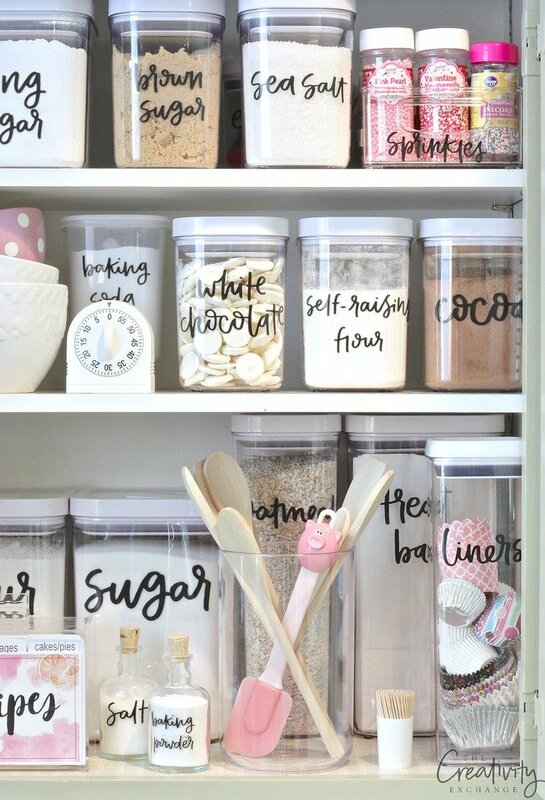 Made my labels…organized my pantry…now hubby can’t find anything!!! 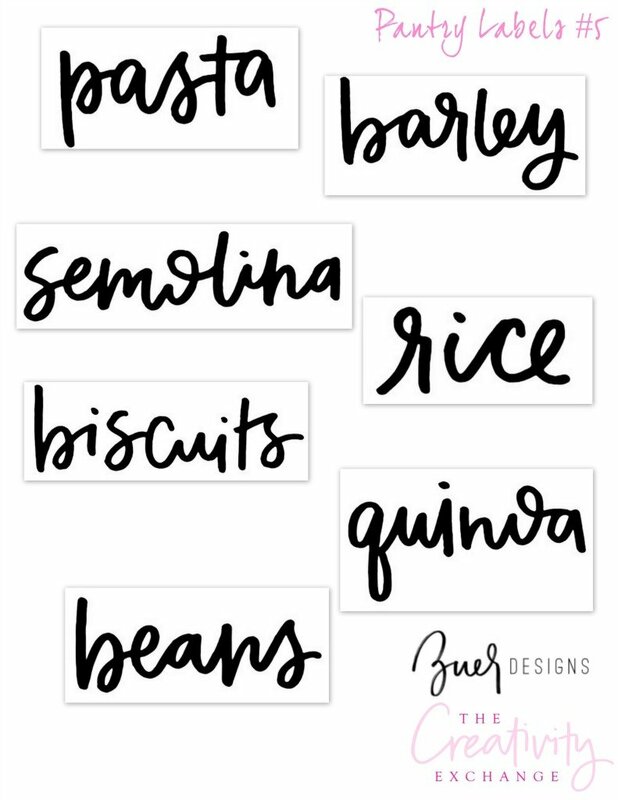 Thank you so much for sharing these FREE printable hand lettered pantry labels!!! They are absolutely beautiful!!! I’m in love <3 It was so very kind of you to offer them to us for free. Looking forward to tackling my messy pantry now. Blessings!! Thank you so much for these labels. They are beautiful! Would you consider making some for other rooms? I would love some for office supplies and laundry supplies. Thanks again! Thank you for making the font so we can make custom labels in addition to the free ones you provided!!! You rock!!! What brand are these containers? I’m having a hard time getting these labels to stay on my spice jars. I bought the Silhouette sticker paper as suggested. Any tips? They are peeling up on the corners within a few hours. Hmm.. I haven’t had or heard of any problems with the Silhouette paper coming up on glass. Did you clean the jars with alcohol to degrease? If there was any residue on the glass, that can have an impact on the sticking. That’s probably the problem because the Silhouette clear sticker paper works really well. I hope that helps! I did clean the jars prior but maybe I will need different alcohol. I ended up placing clear tape over it and it does not show. Perhaps the glass is different? I did look at reviews on Amazon for the paper and a few others had the same problem so not sure! Maybe I should use the plastic containers rather than mason jars. Love this post! Starting to re-org my pantry before baby #3. Where are your containers from/what brand are they? How did you print in Gold? I love these labels. I’m not familiar with printing these, but can they printed in color? Where did you find the potion bottles. I cannot seem to save Pantry Label #5 (5th page). The link for this page seems to not work properly? Thanks and love your labels!!! 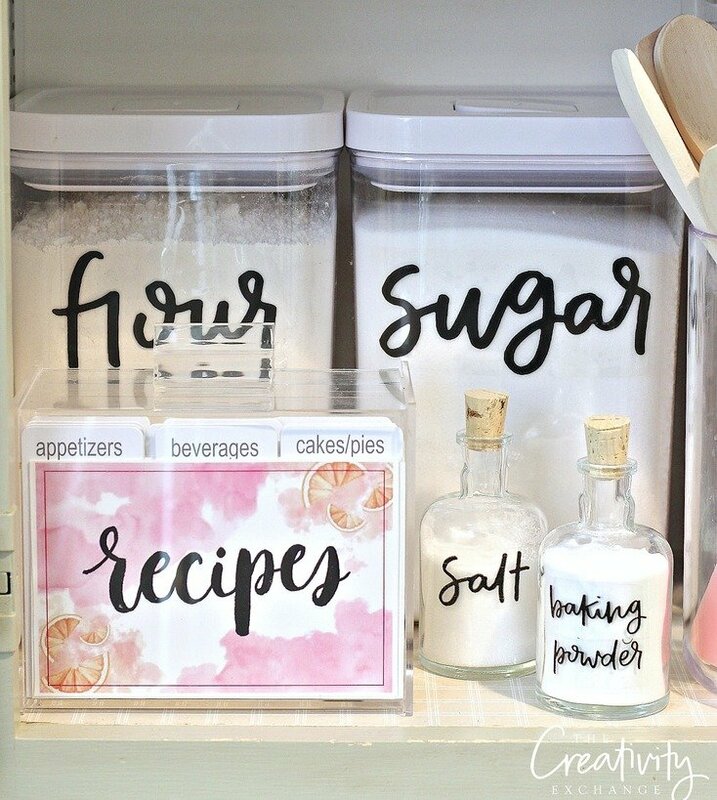 These are so lovely and would make my pantry so pretty and of course, most importantly functional! I was curious if it would be possible to add one for cornmeal? I know that there is one for corn flour, but I didn’t see one for cornmeal. Thanks so much for these beautifully done labels! Thanks for sharing! one question, can I use the sticker sheets with a laser printer? where did you find these containers?! They are perfect! I too am wondering where to get containers like these! Thanks for the labels, they are absolutely gorgeous! I have an Epson inkjet printer … do i need a special printer? So glad you like them! Yes, the ink will smear if you get them wet. However, you can put a clear sheet of the silhouette sticker sheets over your labels to protect. I didn’t do that with mine and haven’t had any problems. When I do go to wash out a storage container, I just remove the label and put it back on after its dry. Hi! Do you have any labels for the refrigerator? I would love to label my drawers and shelves (i.e. Fruit, Veggies, Butter, Eggs, Dairy, Meat, Cheese, etc.)? Thanks! Hello! Firstly, your Free Pantry Stickers are absolutely gorgeous. Thank You so much for sharing your beautiful work with us! I have purchased the Silhouette Clear Sticker Paper and took the downloadable file to my local print place as my printer is not working at present. The lady at the print shop said she couldn’t print them as the clear sticker paper is not A4 – she tried but the machine was not recognising the clear label paper. I would have thought that a print place would work with different sized papers etc. Any information would be appreciated. Many thanks. Your labels are beautiful! I love them and so nice of you to make them available to everyone free of charge. Not to be too picky but the flour should be SELF-RISING instead of self-raising. Thanks again, they’re awesome. What size containers do you use for the flour and sugar? I have been playing with what works best and would love your advice! I have major pantry envy! I love these labels and thank you for offering them for free. I did buy the sticker paper in the link and printed on the best quality and they came out beautiful! But the prints didn’t want to dry, they remained tacky for days, never really drying. The sheets aren’t that expensive so it’s not a huge deal but was wondering if it’s just my printer (i have an epson) or is there a way to dry these, I didn’t think of a blow dryer at the time. anyone else encounter this? The labels are gorgeous!! Where I can find the jars? I love them! These are gorgeous! How can I change the font color? Thank you for sharing! So, I’ve got talents, but not really great ones in the handwriting. I purchased chalk labels and was trying to write them myself. What a mess. These are going to be so easy to wipe off and you can see right through them. Thanks, for all of these. You usually get a free printable. You gave them all. Thank you so much. i also went to January and got the set of Recipe cards. After all we know everything has to match. Thanks again. After I get them up and running I’ll send a pic. Love the labels! Thanks so much for sharing. Looking forward to new post. Going to get to organizing! Can you tell me where you found the “salt” and “baking powder” cork stop bottles? 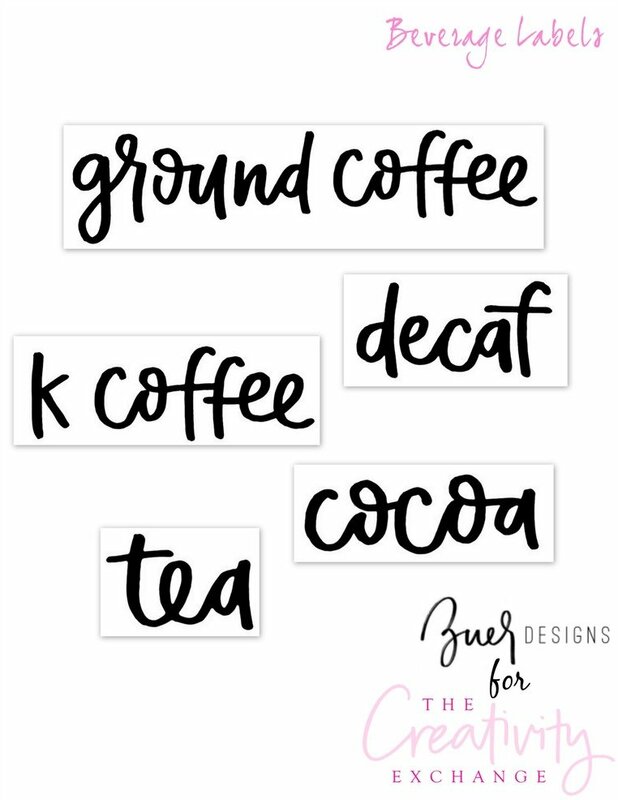 Any chance there’s a way to get these in an svg file for the cricut? These labels are GREAT!! You two are so sweet to make these available. My stupid printer (HP Envy 4522) gives me paper jam every time. Is it possible to make one for self-rising flour, instead of the one you have for self-raising flour? I love your fonts and that you offer them for free. 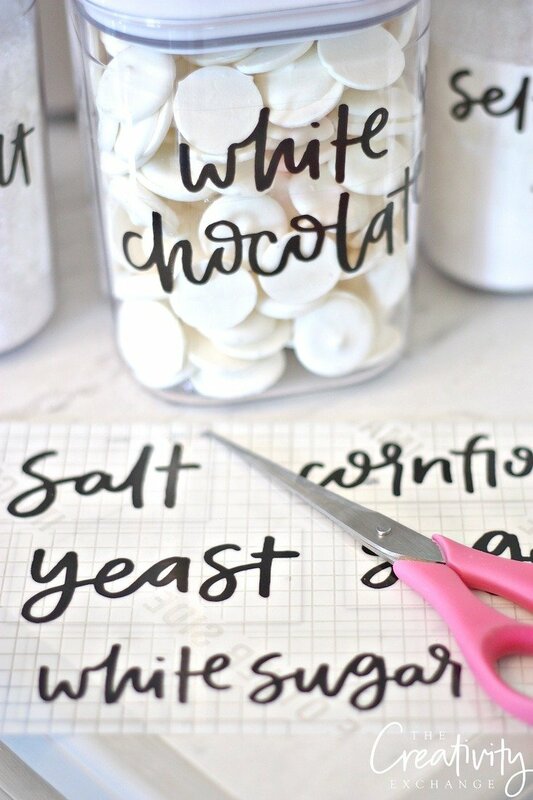 Great ideas for using them even if you do not have a Cricut or Silhouette machine! 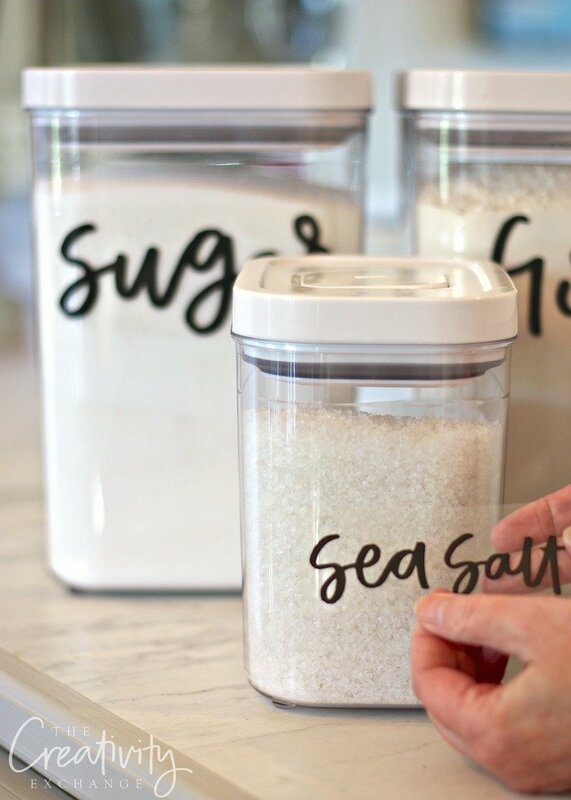 I was wondering if you plan on or actually have now, fonts that will go down lengthwise on an oxo container that would spell out “Spaghetti”, Lasagna, Fettuccine, etc. Can I print these from my Cricut in order to use white vinyl? HI, Do you mind telling me what font you used? Thank you, I love these labels. I’m so bummed, though! I printed and attached these to my new OXO containers, but when I had to wash one, the ink washed right off! I can’t imagine never being able to wash the containers, so what did I do wrong? I hand wash the inside of mine and am just careful not to get it on the label. Of course, these are printed from ink printer so it’s going to smear when wet. You can always make them using a Cricut if you want vinyl. I really appreciate your sharing these with everybody, and as soon as I get on my laptop, I will download these, however I have a request to make. Could you give us one that says self – RISING flour, instead of self-RAISING flour? There are several more I need and was wondering if these could be added. I have self-rising cornmeal, rice flour, potato flour, pinto beans, barley, etc. also white rice, brown rice but I believe you have those already? THANK YOU! could you let me know when the corrected label has been made? I would like to request or basically order some custom labels. I went to the website mentioned in an earlier post but it is not a good address. Could I please have another way to contact someone about my request? Thank you! New to all this… Luv the font n pantry org. label options. Trying to download these to my phone and having trouble on my Android. Was thinking of how to get these into Cricut Air 2 to cut on vinyl. Have never seen such a tremendous response to an offer of free printables! Your hard work is obviously admired and useful to many, myself included. I’m about to purchase a new printer and wonder if you would mind sharing which printer you use. I love your calligraphy, and would even pay to have some more basic ones that you don’t have!! I’ve tried to go to the website listed, and it says your certificate has expired, and won’t go!! Thank you Linda! Great news! 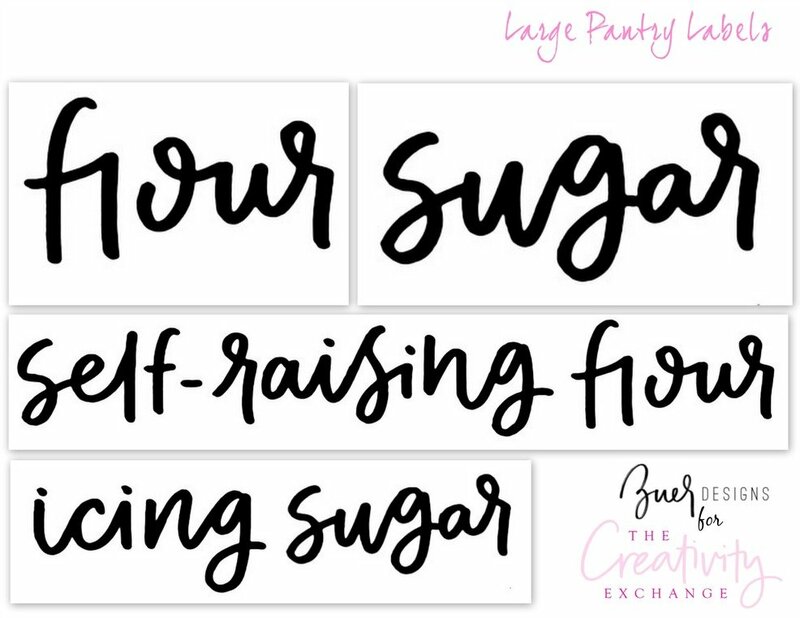 We created a blog post with printable labels that you can now edit in the same font here: https://www.thecreativityexchange.com/2016/08/free-printable-labels-that-you-can-type-in-text-and-edit.html Thank you for the heads up about the issue with Jo’s website regarding the certificate expiration. She is fixing now. Thanks for your note! So glad they are editable via a separate post. No such thing as “self-raising flour”. 🤣 It’s Self RISING. Flour rises, it can’t be raised. That one would have bothered me. Font is cute and I appreciate the tips and freebie file. 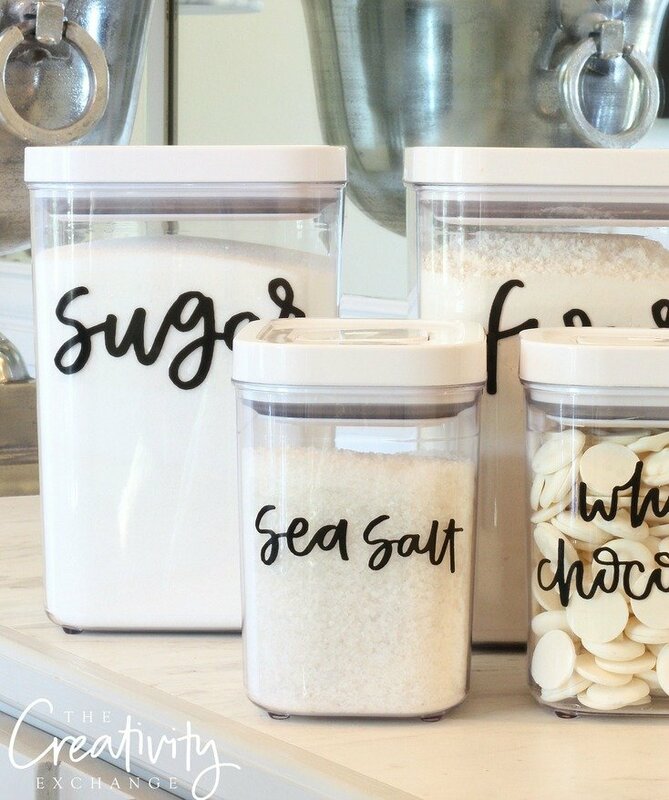 Wow amazing i am definitely tried this for my kitchen jars and container to organize my kitchen properly and I want to share your blog with my friend as well.